Apple is gambling that its customers can be trusted not to steal iPhones from its retail stores. While most retailers are increasing security in order to deter thieves, Apple is actually decreasing security in order to improve the overall shopping experience. Which is a bold move. If you walk into your local Apple Store, you’ll notice everything is essentially nailed down. All of those expensive Macs and iPhones are tethered to the tables to prevent customers from simply walking out with them. So far, so good. And pretty much standard across the retail world. However, Apple is now actively removing those security tethers from the iPhones on display in its stores. It’s starting with the recently refurbished Regent Street store in London, along with a couple of other stores in the UK and Canada. If you walk into one of these stores, you’ll be able to pick up the new iPhone 7 Everything You Need to Know About the iPhone 7 & iPhone 7 Plus Everything You Need to Know About the iPhone 7 & iPhone 7 Plus No headphone port, water and dust resistance, and Apple's best camera yet -- this is the iPhone 7. Read More , carry it around, put it in your pocket, and actually get an idea of how it would feel to own one of these devices. But you could, if you were a despicable human being, also walk out of the store with that display model. You shouldn’t, but you could. There’s a definite risk of this happening, and Apple knows it’s likely to occur on a semi-regular basis. However, Apple also knows that stealing an iPhone display model would be a pretty pointless exercise. First, an alarm would sound as the immoral idiot stealing the iPhone display model left the store. At which point security would pounce on them. And, even if they did manage to get away with their illicit booty intact, Apple would simply brick the iPhone from afar by placing it in Lost Mode using Find My iPhone How to Use Find My iPhone to Get Your Stolen iPhone Back How to Use Find My iPhone to Get Your Stolen iPhone Back Long story short: my wife had her iPhone stolen when she misplaced it at work the other day. I was able to log into her iCloud account and eventually get the device back. Read More . As mentioned above, Apple is only removing the security tethers in selected stores right now. But it’s sure to roll it out to other stores in the future. So just remember not to walk out of your local Apple Store with an iPhone in your pocket. Whether accidentally or on purpose. 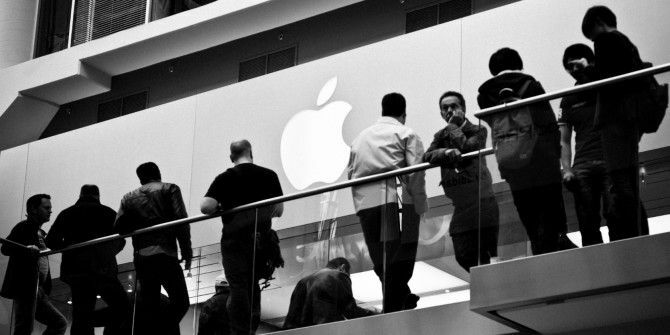 What do you think of this effort to improve the overall Apple Store experience? Are you more likely to buy an iPhone you can handle without having to wrestle with a security tether? What would you do if you saw someone stealing an iPhone from an Apple Store? Please let us know in the comments below! Explore more about: Apple, iPhone, iPhone 7, iPhone 7 Plus. Walks into an Apple store, looks down at the iPhone table and gets the attention of an Apple store employee. "Hey, where are all the iPhones?" "Uh....I think that dude over there has them." "Yes. He wanted to see how all of them felt in his pockets." OK. So this probably won't happen, but don't you think it's weird to potentially have to walk up to someone and ask if it can be your turn to see an iPhone. I'm sure there will be controls in-place, but it does make you think. I'd say it's pretty cunning PR move: "Look, our phones are so useless to thieves that we're gonna let anyone steal them to try". I know from experience that you *can* recover a stolen iPhone using Find my Phone, and it works. I knew before my wife called me that her phone had been stolen, and I was following it on a map until I had their address.